Here’s how to save on upgrading your wireless network, an Apple watch, pretty much everything on eBay, and a whole lot more of today’s best deals. That’s only scratching the surface though, so head over to Amazon to see the rest of the deals, or check out this post to see our recommendations. Don’t need the scanner? The smaller 2350DW is still on sale for $89 as well. Elsewhere on eBay, you could pick up some video games from Best Buy’s eBay outlet, buy a Nintendo Switch, Xbox One X, or PS4 Pro below MSRP, grab a year of Xbox Live or PlayStation Plus (gift cards are excluded, but these aren’t considered gift cards), score a rare deal on YETI coolers, stock up on World Cup apparel, or just save on whatever obscure or out of print item your heart desires. It’s up to you, just be sure to make your purchase today. If your mechanics tool set could do with an upgrade, this massive 247 piece kit from DEWALT is a few bucks off its regular price today, and comes with a bonus DEWALT drilling/driving set, which currently sells for $40 on its own. We’ve seen this mechanics set go for less in the past, but if you have any projects on the horizon where it could be helpful, this is a very solid deal. Just remember that it’s only available today, or until sold out. If you’ve heard of Tiger, the first thing that comes to mind is probably the Japanese company’s excellent rice cookers. But turns out, they make travel mugs too, and they’re all under $13 in today’s Amazon Gold Box. Several colors and varieties are included, and they’ll all keep your drink hot or cold for hours on end. 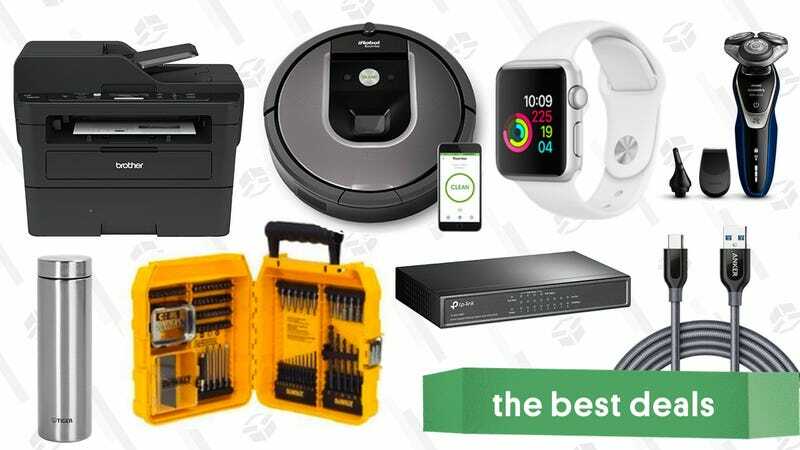 Amazon’s listed $590 price is an all-time low, and an extra $10.50 coupon you can clip makes it the best deal we’ve ever seen. Needless to say, this would make a killer Father’s Day gift too. This 6-piece stackable container set will keep your refrigerator looking presentable. It comes with special sizes for cans and eggs, and then more generic shapes for everything else. This set normally bounces around ~$35, so grab it today for $23 on Woot before this deal gets moldy. Climb up this Little Giant 15' lightweight ladder for just $145 on Woot today. The triple-locking hinge bends to turns this into an A-frame ladder, stair ladder, or extension ladder, and then can fold back up for easy storage. We saw it dip down to a slightly lower price over Deals Week, but $145 is a good $40 less than its Amazon price, so go ahead and get high. If you’re ready to upgrade to an electric shaver, you could do a lot worse than the Philips Norelco 5570 for an all-time low of $75. You can use it wet or dry, its built-in battery runs for an hour on an hour’s charge, and it even comes with sideburn and nose/ear trimmer attachments for detail work. Amazon’s only shaving the price on this thing for one day though, so don’t miss out. In addition to functioning as a normal digital bathroom scale, the Eufy BodySense can measure metrics such as body fat percentage and body water, and sync all of that data over Bluetooth to your iOS or Android smartphone. You can see my impressions here, but it’s the most seamless and reliable smart scale I’ve ever personally used, and a great deal at $29. Each dumbell adjusts in five pound increments starting at 10 pounds and going up to 50. This set is selling for around $270 on Amazon, so today’s $230 from Woot is a solid discount. With 650 American Test Kitchen-developed recipes, The Complete Cooking For Two Cookbook should add a little variety to your meals. And, since all the recipes are designed for just two portions, you won’t get stuck with days and days of leftovers.